The AME5250 is a high efficiency monolithic synchro- nous buck Regulator using a constant frequency, current mode architecture. Capable of delivering 1A output cur- rent over a wide input voltage range from 2.5V to 5.5V, the AME5250 is ideally suited for single Li-Ion battery powered applications. 100% duty cycle provides low dropout operation, extending battery life in portable sys- tems. Under light load conditions, the AME5250 oper- ates in a power saving mode that consumes just around 20mA of supply current, maximizing battery life in por- table applications. By AME, Inc. 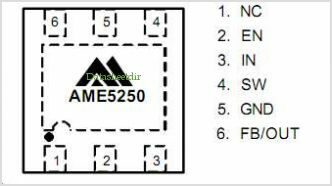 This is one package pinout of AME5250,If you need more pinouts please download AME5250's pdf datasheet. 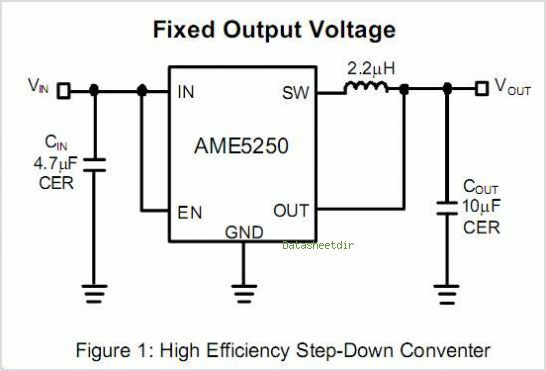 This is one application circuit of AME5250,If you need more circuits,please download AME5250's pdf datasheet.